The STEP project that I engaged in was an OSU study abroad program. 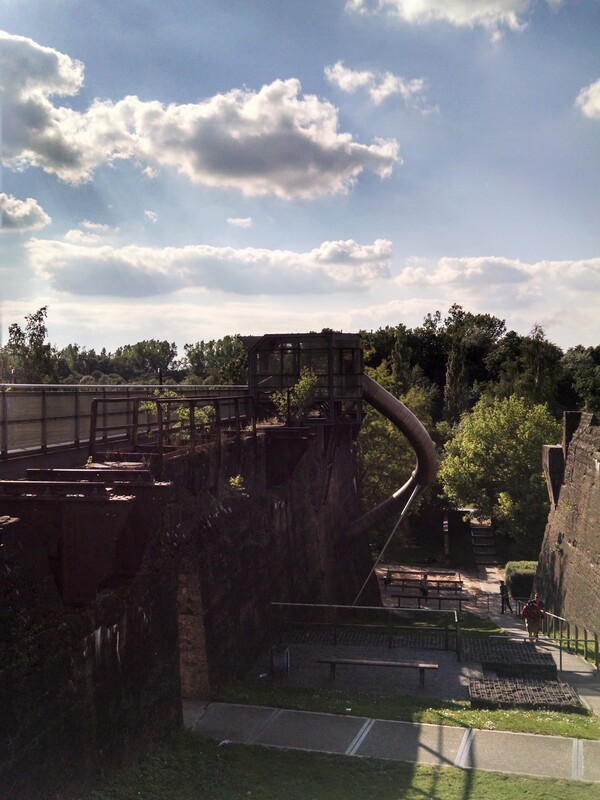 I travelled to Europe with the Knowlton School’s European Architecture Maymester program. Over the course of the month, we visited seven countries and studied almost 200 important works of architecture. Prior to my STEP experience, I was considering focusing on residential or educational architecture in my future career. During the trip, however, I noticed that my attention wandered from these traditional typologies of architecture to factories and landscape architecture spaces. My interest in factories was not surprising; my father owns a woodworking factory and I grew up in the factory environment. The landscape interest was something new. While I had always appreciated exterior spaces before, I now see landscape architecture as a profession which engages with current environmental problems while creating dynamic situational spaces for people to meet, socialize, contemplate, or exercise. As a senior looking for post-graduation employment, thanks to my STEP experience I plan to apply to both traditional and landscape architecture firms. Over the course of the trip, whether because of room assignments or going out to eat on free nights, I ended up spending a significant amount of time with students that I had previously thought that I had little in common. Through this experience I have come to know some of them as some of the most kind, unassuming, and welcoming people I know. When I started at the Knowlton School, I had a hard time relating to the students in my year. Growing up homeschooled in China tends to put you at a disadvantage when everyone is bonding over awful high school stories, and I assumed that other students wouldn’t like me due to our differences and therefore isolated myself. Spending time with my fellow architecture students in this concentrated environment allowed me to get out of my self-induced social-coma. 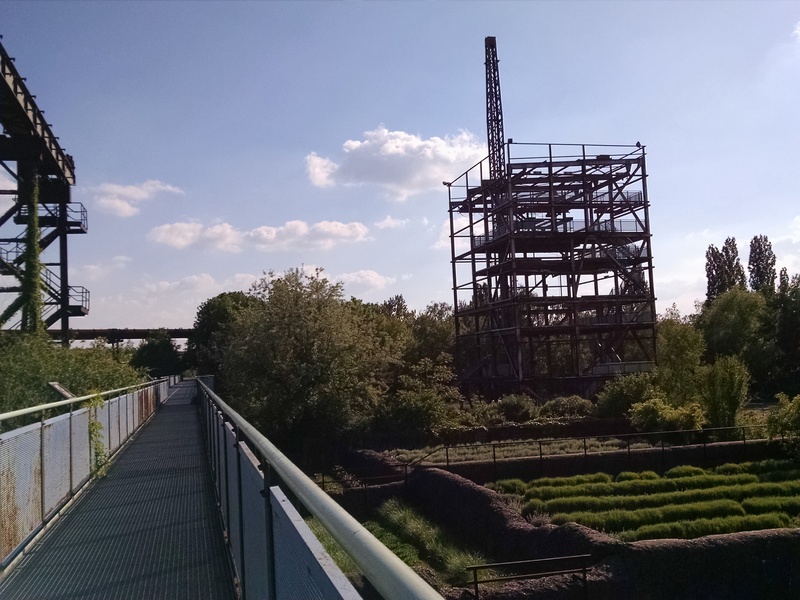 One of the most thrilling places that we visited was the Landschaftspark Duisburg-Nord in Duisburg, Germany which had been designed by landscape architect firm Latz+Partner. We arrived late in the afternoon on our tour bus and were told to “go play.” However, we had to be back at the bus in two hours. By this point in the day we had already been to a few cathedrals and toured an ancient silver mine (all in the same day), so we were very tired. 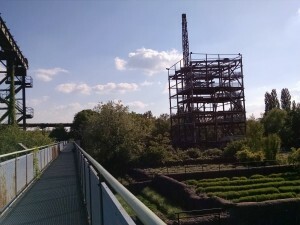 The park was located at the site of an old iron-working factory which had not been used for many years. The landscape architects were challenged to re-program the site for public use while not erasing the character of the site, creating a living memorial of a former time. The idea was to work with existing site components to the point where grandfathers could take their grandchildren to the park to play and say, “I used to work on that [insert factory department]!” The park was filled with frame after frame of amazing views, from tranquil pools of water in giant vats, abandoned railway structure, to cat walks in the air created from pieces of old building from which I saw a series of delightful tiny “secret gardens” tucked into the half-destroyed cellular storage rooms of the factory. The park registered in me a nostalgia born from growing up hanging around my dad’s factory in central California, pre-recession. While in Paris, we stayed in apartment-style housing at a hotel, with two rooms and a kitchenette. The suite I shared with three other girls opened onto a terrace, and in the evening we gathered outside with some of our other classmates. It wasn’t a big deal to them, but for me it was the first time that I had hung out with them outside of studio at school. As we sat there, talking about things we had seen that day, listening to music, I felt included as I had never felt in architecture school before. Later that night the others went out clubbing while I stayed behind to relax, take a bubble bath, and catch up on sketching. Out of habit I locked the door and eventually went to bed. In the morning I woke up, surprised and alarmed that my roommates had not returned during the night. They were locked out! Though understandably annoyed, they were remarkably forgiving and didn’t hold it against me for the rest of the trip. These memories are important to me as a remembrance of good times, but also as a landmark of growing up and being able to socialize and feel comfortable in my own skin. Moving forward in my career I am full of questions as to the direction my path may take due to the unexpected things I discovered about myself in Europe. The library of both architecture and landscape architecture spatial ideas developed during the program is proving to be extremely valuable as I start my senior studio in architecture. As a more confident, well-rounded student, I approach graduation and joining the working world with anticipation and excitement about things to come.